With the dip in temperature sweeping through last week, it was a good reminder that soon it will be time to pull out the down blankets, wool hats, and fuzzy sheepskin slippers. Some may have even teased the idea of turning on that dusty house heater to escape back into summer for just a little longer. This season, look into a more efficient and better way to heat your home. Spot heating using wall heaters has many benefits, and can improve the long winter months. Have empty rooms in the house? Instead of heating the whole house at once, use wall heaters to heat only the rooms that are being used. Instead of waiting for the whole house to be heated, wall heaters will heat the space more quickly. Finally, the bathroom will be warm before you have to get out of the shower in the morning! Everyone has their own idea of a comfortable, ambient temperature. Wall heaters allow each person to set the temperature to their own preference while they are in the room. Since wall heaters don't use any external venting, all of the heat and energy the heater creates will go to your home instead of up the chimney. 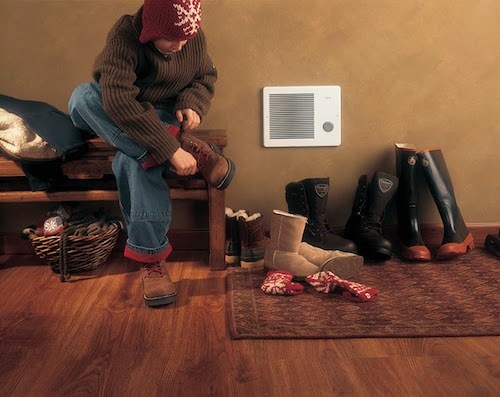 The many sizes available make it easy to select a heater that is perfect for each individual room. Baseboard heaters sit low to the floor and are perfect for bedrooms and bathrooms. A wall-mounted thermostat installed above it make it easy for anyone to control the temperature. The BROAN model 112 is perfect for small areas where high heat output is desired, like a bathroom. A variety of wall mounted heaters and thermostats are available, each catering to different room sizes and functions. High capacity heaters are ideal for entry ways, lobbies, or large rooms requiring a high wattage heating. For areas like this, consider the BROAN 9810WH wall heater. Smaller rooms only need lower wattage heaters, or ones that can be converted to half-wattage, in order to heat the room perfectly. Another good use for these heaters are large rooms with multiple heaters. Use one to heat only a portion of the room at a time, or turn them all on for a cozy, evenly heated atmosphere. Our most popular fan wall heater is the Cadet CSC101TW. Shop for the perfect wall heaters for your home, and check out our selection of wall, kickspace, and baseboard heaters!